Animation of earthquakes (including aftershocks) in Nepal from 2015-04-25T07:00:00 to 2015-04-25T23:07:17 by hours. Сondolences to the families of the victims! Data for this map was taken from USGS. USGS is a science bureau within the United States Department of the Interior. 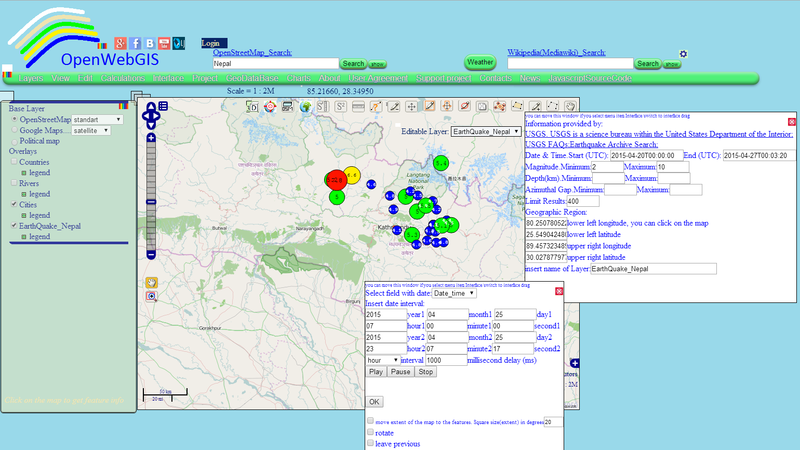 It can be available with menu item of OpenWebGIS: "GeoDataBase->Earthquakes Database"
Figure 1. -general view of earthquakes. Map 1 - Animation of earthquakes (including aftershocks) in Nepal from 2015-04-25T07:00:00 to 2015-04-25T23:07:17 by hours. You can analyze this data using all the opportunities of OpenWebGIS interface if you open this web-link.